TheAngrySpark: The God of... whiskey? 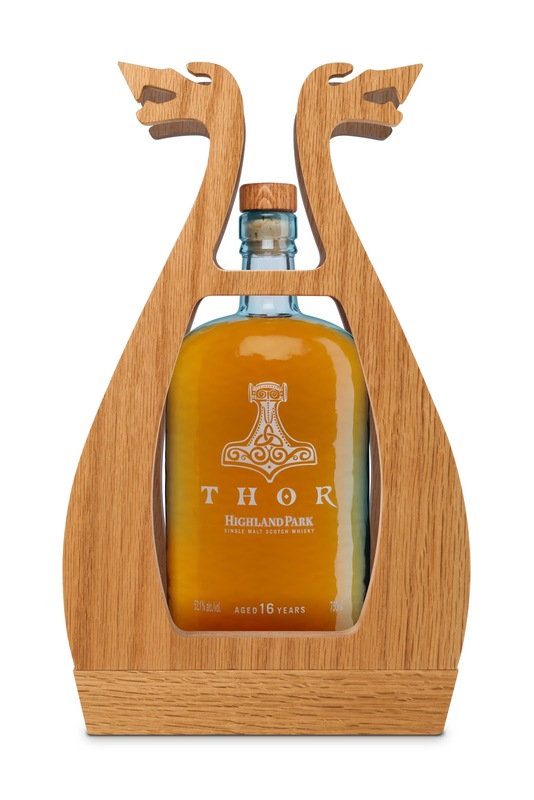 Yes we all know that Thor (both of the mythological and comic book varieties) can swing a mean hammer and bring down the thunder and lightning... but he can whip up a mean drink too- This one's for the grown-ups out there. And by "mean drink", I mean whiskey. Highland Single Malt Scotch Whiskey has just released it's first bottle of the new Valhalla Collection. The set (which'll eventually include 4 different drinks) takes it's inspiration from the hallowed halls of Asgard and the pantheon of Norse Gods. The set is mainly nodding towards adult (duh- don't drink, kids) collectors as it will be amazingly limited in the scope of it's release. The first issuance - Thor - also has just about the coolest bottle I've ever seen. This limited edition release comes out just in time for Father’s Day and is the perfect gift to celebrate Dad and his bold character, just as the Norse god possesses himself. This collectible whisky will also be a welcomed addition to any rare Scotch collection or a great gift for the comic book enthusiast. Highland Park is distilled in Scotland’s Orkney Islands at the world’s northernmost distillery, resulting in a uniquely flavored Scotch, unlike any other single malt. With only 1,500 being released in the United States, this special liquid is bottled at a robust 52.1% ABV and housed in a unique wooden frame echoing the fearsome contours of a traditional Viking long ship. The taste and look of Thor mimics the masculine traits of the Nordic god, known to carve valleys into mountains and strike fear into his opponents. It is sure to inspire any dad to find his inner warrior and conquer anything this summer whether he’s head of the house, master of the office, or captain of the grill! Palate: Thor’s high strength grabs the palate and refuses to let go. Initially dry, with fiery gingerbread then vanilla, blackberries, fresh mango, peach and hints of cinnamon. As its big flavours swirl around the mouth, some softer, sweeter notes develop, giving Thor an unexpected layer of complexity and depth. Those of the 'over 21' (in the States at least) can learn more about Thor (the drink, not the God) here.